Acura is releasing the new Acura TLX PMC Edition at the New York International Auto Show next week. The PMC Edition combines the sports prowess of the A-Spec line with the premium technical features of the Advance Package. It will also share the super high-tech nano paint technology used on the NSX which takes a total time of 5 days in the paint shop. Built in Marysville Ohio, the TLX PMC Edition will be handcrafted by the same engineers who build the Acura NSX. Equipped with the direct injected V6 and SH-AWD, the limited production run cars will start around $50,000. The TLX PMC Edition goes on sale Summer 2019 with an MDX version to follow. We'll have more for you about the Acura TLX PMC Edition from the New York International Auto Show on April 17th. WOW We get an Acura PMC TLX SH-AWD SH-AWS with special paint. I think Acura could get a few more letters on the back. Well, it's also hand built and has all of the top possible packages that otherwise can't be mixed together today. So it really is an ultimate TLX. I saw a TLX coming at me the other day at dusk and it really does have a striking face with those headlights. I will say it does look quite cool...color and all! Basically a grown up ricer’s dream car.. But I bet it is fun to drive though!
" Dual 4-inch black chrome exhaust finishers "
Wish Cadillac would realize that not everyone wants normal chrome. 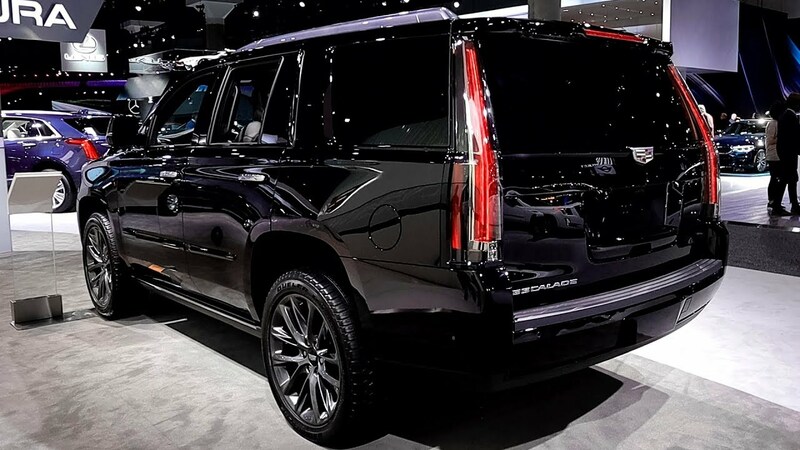 Just think of a Platinum edition Escalade all in Black Chrome. Now I really need to get one! I wish that "hand built engine" would have more power than the standard TLX. It looks nice but without any performance upgrades it is just a poser package. A lot of that is on Cadillac's accessory page tho.. including black chrome exhaust. And Midnight Silver is really Black Chrome imo. U know what's crazy? I didn't realize that U could get the Sport Edition Escalade in Red Passion Tintcoat, Satin Steel Metallic or Black Raven. I thought it only came in Black til I was just on the accessory page. Red Passion Tintcoat with Black Chrome would be AWESOME! They really need that rumoured turbo 6 ready for the next gen of this car and their CUV's..
Yup just like They still make A,B & C Mercedes? The A and C Mercedes sell, the TLX, not so much. Could not prove that by me, E and S are the bulk of what I see in the PNW and of course all the variations of their CUVs especially the bargain basement GLA CUVs that are everywhere and are driven bloody slow especially the AMG version. I have never seen an A in the wild and the C while popular maybe 10 years ago, I rarely see any now, if I see one, once a month that is surprising here. A-class/GLA/CLA sold about 400,000 units world wide last year and C-class was near 500,000 I think. Plenty of volume there, E-class was around 350,000. Love how you are mixing the numbers up again as I talk US and you go to World Wide sales to attempt to Justify the numbers. C-Class 2018 sold 60,410 down from the 77,446 in 2017. CLA 2018 sold 22,556 up from 20,669 in 2017. GLA 2018 sold 24,136 up from 24,104 in 2017 but just barely, stagnate most would say. A-class 2018 sold ZERO in the US. Will be first year for this model in 2019. BUICK CUV's out sell the GLA each one beats it, seems plenty of other nice cars beat the C & A too. Toyota seems to have no problem doing this at those price points. And how is the TLX selling? Especially since it is made in USA for USA and they don't have much global volume off it, if any. TLX was down 12.6% in 2018 and it is down 21.6% YTD. They sold 30,000 of them in 2018, they'll probably be lucky to get 25,000 sales this year. And that is pretty much their only sedan now. MB only sold 22K CLAs in 2018 competing against the TLX, so the TLX is obviously the better car. I mean; if you're looking for a FWD premium small sedan, why go with a copy? What is the point your trying to make when the TLX 30,000 beats the CLA 22,556 handsomely? Remember, throwing stones in glass houses is not a good thing. ILX is a CLA competitor. TLX competes with C-class. TLX & CLA have the exact same starting MSRP - your standard metric for deciding what competes with what. And being that's the case, the sales scenario where more buyers are choosing the TLX over the CLA is pretty damning. The TLX is also a mid-size car, it is near E-class size. But the e-class starts @ $53K - no one is cross shopping that with a car that starts at $33K! Yeah, I'm sure people were beating Acura dealer doors down for a hand built 50K TLX. Just offer the stupid Pkg on an A-Spec and be done with it. Valencia Red Pearl nano pigment paint Unique PMC Edition numbered serial plaque Gloss black 19-inch split-5-spoke wheels with black lug nuts Gloss black roof panel Gloss black door handles Gloss black diamond pentagon grille with body-colored grille surround Dual 4-inch black chrome exhaust finishers Premium black Milano leather seats with Alcantara™ inserts, black piping and red stitching Perforated leather-wrapped steering wheel with red stitching and paddle shifters Red stitching on door panel, center console, and armrest Premium floormats with metal A-Spec badging The TLX PMC Edition goes on sale Summer 2019 with an MDX version to follow. We'll have more for you about the Acura TLX PMC Edition from the New York International Auto Show on April 17th. Pebble Beach could mark the debut of a nearly production-ready version of the Acura Precision concept. The concept debuted at the 2016 Detroit Auto Show and previewed Acura's Precision Crafted Performance design theme first seen in production on the 2019 Acura RDX. While there are (hopeful?) rumors that the 4-door coupe will wear the name Legend, there is not enough evidence to support them. What that means for Acura's aging RLX sedan is anyone's guess. Also coming is an updated Acura TLX with a Type-S version, a new Acura MDX, and rumor has it even the ZDX may be making a return. All of these could debut over the next 12 to 18 months, but Pebble Beach is in August, so we'll just have to sit tight until then.